A fun fresh way to serve watermelon. This is a great recipe and only takes a few minutes to put together. 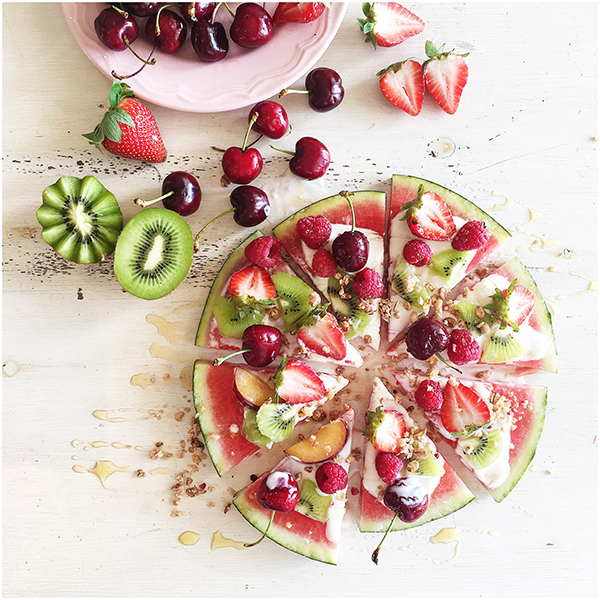 You could even put all the ingredients in the center of your table and allow people to make their own slice with any choice of toppings. Cut the melon roughly an inch thick through the center to keep the round shape. Cut into pieces, like it’s a pizza. Spoon yogurt over the pieces from the center (AKA the point) outwards toward the rind. Place your selection of fruit on top. Lightly sprinkle on the granola and drizzle agave on top.